In a Yagi-Uda 3 element directional antenna, the _______ is primarily for mechanical purposes. In a Yagi-Uda 3 element directional antenna, the _______ is the longest radiating element. 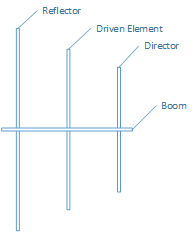 In a Yagi-Uda 3 element directional antenna, the _______ is the shortest radiating element. In a Yagi-Uda 3 element directional antenna, the _______ is not the longest nor the shortest radiating element.